Click to find out more details on our physiotherapy services. 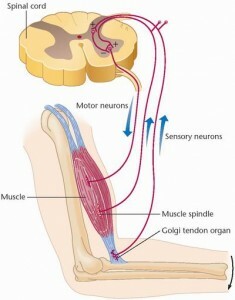 One of the most important features of physiotherapy rehabilitation is to restore something known as proprioception. It’s a very special sense that you probably don’t even realise you have. Proprioception refers to your ability to tell where you’re body is in space and more specifically where each body part is in relationship to each other. This is really important for things you probably take for granted. Like knowing your foot isn’t twisted before stepping on it. You do this without looking and you can even walk quite well in the dark- provided there’s nothing in front of you. The way your body does this is through small receptors found in the muscles and joints of the body. These are called proprioceptors and they note what position the muscle is in and send that information back up to the brain. The brain then uses this information to work out where that body part is in relation to other body parts. That’s quite impressive when you think about it. One of the side effects of having an injury is that you lose some of your proprioception. If you’re just a little bit less accurate at judging where your body is in space you are surprisingly more likely to have another injury. So while often nature takes its course and does all the hard work of healing. You might notice that for a long time after the pain has gone, the area still doesn’t quite “feel 100%”. The good news is that your physiotherapist can address this during your rehabilitation. They will prescribe a series of balance and control exercises along with strengthening and stretching that help to restore your proprioception. Making sure you’re completely ready to get back into the activities you love without any more injuries.